CABLE HIGHLIGHTS: Discovery’s CURSE OF OAK ISLAND led Tuesday cable, up 0.08 from last week to 0.85, with lead-out TIME MACHINE at 0.43. 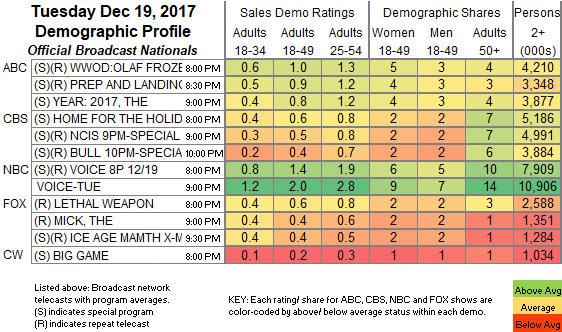 On USA, WWE SMACKDOWN gained 0.04 to 0.75, and 2 episodes of CHRISLEY KNOWS BEST were at 0.41/0.34, compared to last week’s 0.52. Bravo’s REAL HOUSEWIVES OF BEVERLY HILLS returned at 0.61, with a pre-show at 0.24, and lead-out STRIPPED up 0.05 to 0.20. On HGTV, FIXER UPPER dropped 0.08 to 0.46, HOUSE HUNTERS lost 0.04 to 0.32, and HOUSE HUNTERS INTL was up 0.02 to 0.28. ESPN’s COLLEGE FOOTBALL bowl game was at 0.42. On TBS, JOKER’S WILD rose 0.04 to 0.40, and DROP THE MIC was down 0.04 to 0.26. On Discovery, MOONSHINERS fell 0.11 to 0.38, and BUSHCRAFT BUILD-OFF was down 0.02 to 0.26. Adult Swim’s late-night TENDER TOUCHES was at 0.37/0.33. MSNBC’s RACHEL MADDOW SHOW topped cable news at 0.35/0.51/2.7M, over Fox News’s INGRAHAM ANGLE at 0.26/0.41/2.4M and CNN’s ANDERSON COOPER 360 at 0.24/0.30/1.1M. 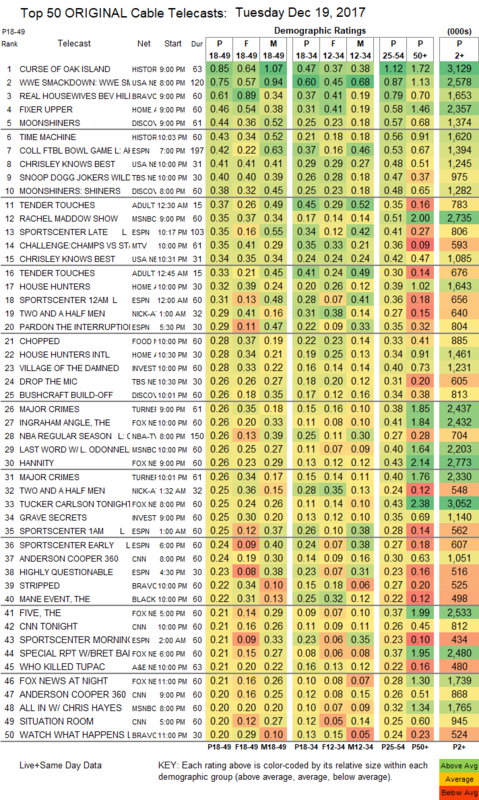 MTV’s THE CHALLENGE climbed 0.03 to 0.35. Food Network’s CHOPPED ticked down to 0.25. On ID, VILLAGE OF THE DAMNED slipped 0.02 to 0.28, and GRAVE SECRETS was down 0.03 to 0.25. 2 pivotal hours of MAJOR CRIMES on TNT were at 0.26/0.26, up from last week’s 0.20 hour. The finale of BET’s THE MANE EVENT was steady at 0.22. A&E’s WHO KILLED TUPAC rose 0.03 to 0.21. A MARRIED AT FIRST SIGHT special on Lifetime was at 0.17. The finale of NatGeo’s LONG ROAD HOME gained 0.03 to 0.13. Spike’s I AM SAM KINISON special was at 0.11. TV Land’s TEACHERS grew by 0.03 to 0.11. Tru’s AT HOME WITH AMY SEDARIS fell 0.04 to 0.09. The finale of HBO’s GUNPOWDER was at 0.07.